How a one-man developer crafted this fascinating puzzle game. If you've been following our coverage recently, you'll know that we're rather taken with Guide The Light, the latest release from publisher AppyNation. 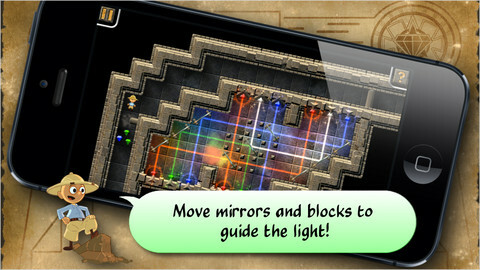 It's an intriguing puzzle game that challenges players to guide beams of light around a generous selection of levels to solve puzzles and tease open doors. 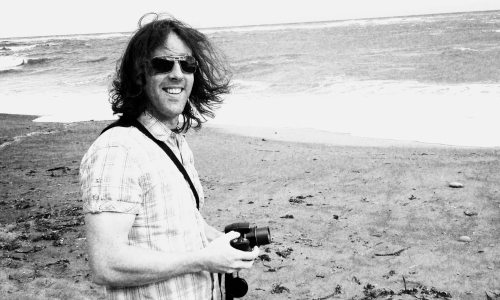 We decided to check in with Paul Ripley, Founder of Phasic Labs and one-man developer of Guide The Light, to talk about creating the game. Can you tell us a bit about your development background and how you came to work with AppyNation? I started tinkering with programming way back in the days of the Commodore 64, but never made any fully fledged games. I first got into developing games much later on, when I started work for Magenta Software in Liverpool, working on PlayStation 1, and later PlayStation 2 titles. I worked on 3 titles there, and then took a year out to write music, do gigs, and write audio and VJ software. That was great fun, but not a great way to pay the bills, so I went back to the world of employment, eventually ending up at Sony Studio Liverpool working as a programmer on the PlayStation 3 launch title 'Formula 1 2006 Championship Edition'. I stayed at Sony for about 5 years, working on Wipeout HD (PS3), Motorstorm 2 : Pacific Rift (PS3), and on a load of prototype projects. Unfortunately, I was made redundant in 2010, and that's when I decided to go solo. I nearly took a job at Bizarre Creations, but decided to try my own thing for a bit, which is fortunate as Bizarre Creations closed its doors forever later that year. I learnt iPhone development, and released Hexius within a few months, and then ended up back at Sony part-time, doing contract programming on the Vita launch title Wipeout 2048. At the same time as I was contracting, I was developing Guide The Light, along with about 4 other iPhone prototypes which will hopefully turn into full games in the future. Studio Liverpool sadly closed earlier this year, so I'm working full time on Phasic Labs projects now. Regarding the publishing of Guide The Light, I had previously been working with another publisher for a number of months, but that didn't work out. I was just wondering whether to self-publish Guide The Light when Jon from Onteca, another local indie developer, mentioned he was involved with a new publisher that was focusing on publishing indie mobile titles. That publisher was AppyNation, and after I dropped them an email, we had a phone chat and everything was agreed nice and quickly. I decided it was better to let someone else handle the promotion, as I just don't have the resources required for that as a one-man studio. I'd much rather focus on development, and promoting a mobile title nowadays is a full-time job. What was the inspiration behind Guide The Light, and can you talk us through the development process of the game? I couldn't really say what the inspiration for Guide The Light was. I had the idea many years ago, but never had the time to make it. I just really like puzzle games, and thought the idea of having to move light through a maze could really lend itself to making lots of creative levels. I got the basics of the game up and running (complete with terrible programmer graphics) in a matter of weeks, and then spent a long, long time trying out level ideas, refining the various components of the puzzles, and generally tuning the prototype. Originally the levels were much bigger, multi-screen levels, but I decided it was much nicer (and less brain-melting) if you could see the entire level at once. 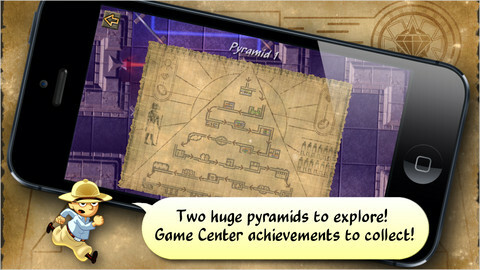 This reduced the scope of the puzzles that could be developed, but it turned out that there was still plenty of space to develop a great variety of levels. The whole process took longer than it should have done, as I was contracting for half the week, and also developing other prototypes at the same time. After a few iterations though, it became apparent to me that Guide The Light had definite potential, especially after handing early prototypes over to friends, and then coming back half an hour later to find them still playing. People also kept asking me if I had any new levels for them to try, which made me think I was on to something. Since it's release I've had friends blaming me for their lack of sleep, because they keep waking up and deciding to tackle a level! How has the game performed on the App Store since release? Is it meeting your expectations? It's not doing great to be honest, despite the top reviews on the App Store, and some excellent reviews on some great gaming websites. It's early days though, so there is still hope. It seems much harder now to get the initial exposure on the App Store than it was 2 years ago, when new releases were both less frequent, and more prominent on the front page. Were there any puzzle elements you prototyped that didn't make it into the final release? There was one element which I removed. It was uni-directional conveyor belts, so that if you dragged a mirror onto one, it would slide to the far end, and you wouldn't be able to slide it back. This just made levels really annoying though. You often ended up not being able to finish the level, or had to slide mirrors back to the start via another route. This also made the puzzles much harder to design for some reason. It was already hard enough to design the levels, as I'd set myself the goal of designing levels that only had one solution, which I did in most cases. Some levels have a few solutions, but as far as I am aware, you can't complete any of the levels without using all of the mirrors and blocks. If you find any that can be solved with mirrors to spare, please let me know! It's a tough game! Was this a deliberate design decision, or do you feel this is just part-and-parcel of the puzzle mechanics? I wouldn't say it was deliberate, although I didn't want to make a game that you could just walk through in 30 minutes without having to think. It wouldn't be a puzzle game if you didn't have to solve any problems. I think that some difficulty is required for the player to get a sense of achievement when they complete a level, otherwise it's just grinding through a game for no reason. To some extent it is part-and-parcel of puzzles though. Most of the Guide The Light levels are obvious once you've seen the solution, but until you've seen it, it can require some hard work! Different people seem to find different levels difficult though. There doesn't seem to be much of a consistent view on which levels are particularly hard. I ordered the levels based on metrics I gathered during beta testing, so that there is a level of progression which should suit most players. The game might be a bit tough, but current metrics seem to be showing players are generally progressing pretty well, and at a steady rate. It seems like a title that PC gamers would be keen to get stuck into. Do you have any plans to release the game on this or any other platforms? The game is built on a custom game engine I've been gradually developing over the years, so it is fairly simple to port onto any platform that supports OpenGL, OpenAL, and C++. My next target is the Mac App Store, as I already have a build working on OS X.
I'll probably also look at Android, as it should be easy to port. I'm not too familiar with the PC market, but I don't see why it isn't possible. Testing is harder though, with so many different configurations out there, and the major annoyance with the latest versions of Windows is the lack of support for OpenGL, particularly on the mobile version. There seems to be no good technical reason for that, and it just makes porting that bit more time-consuming. Will the title be updated with more puzzles in the future, or can we expect any new puzzle types? If not, what are your next plans for the mobile market? 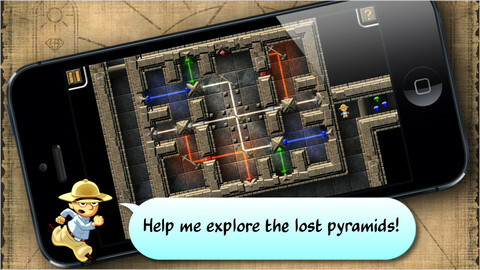 I certainly plan to release updates with more pyramids, although I don't have a timescale for that yet. If the game does well, then that will become a clear priority. I have quite a few levels that didn't make the first cut, but have plenty of potential to be tweaked to a standard that I'd be happy to release, and I've many great ideas for levels since I made the first two pyramids. I want to turn some of my other prototypes into fully fledged games, I've got a major revamp of Hexius due soon, which will bring full retina support, and iPhone 5 support, as well as switching from OpenFeint to Game Center, because the OpenFeint servers are being switched off very soon. Do you have any tips for beating Guide The Light that you'd like to share with Modojo readers? My main tip would be to think about how to solve the level before moving any mirrors. It's fine to experiment on the earlier levels by dragging mirrors around to see how everything works, but towards the end of each pyramid, once you start moving mirrors, you will have to work quite quickly, so it's good to get used to planning ahead. Also, try and remain calm. When spiders appear, or spikes start moving, people tend to panic and start moving things as fast as possible. If you slow down and consider your moves, you'll realize that you've actually got plenty of time! 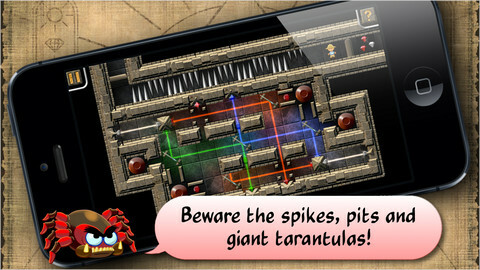 If you find yourself running out of time on some levels, try and work out at what point the spiders or spikes appear. Often they are tied to a specific crystal (or combination of crystals) being lit by light beams. Once you work that out, you can avoid lighting those crystals until you've got all your other mirrors in place. Finally, take note of the doors that can be opened and closed by moving light beams - they might be useful if you close them at just the right time!